To complement the updated bag system, which I spoke about last time, I decided to add a TAB onto the PC Character Screen GUI that would allow access to more information about the whole party with respect to crafting skills and the more common related items, which the party held as a group. 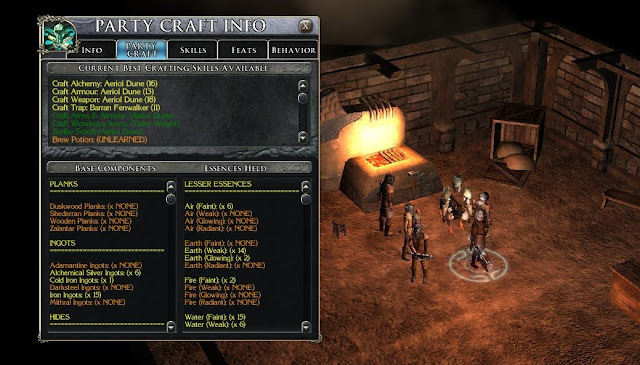 This way, it is much simpler to keep track of which PCs have which skills, and what party crafting abilities are available to the group as a whole. Also, common items such as planks, ingots and hides, along with the lesser and greater essences can be seen in an instance and in one place. I, for one, find this much easier to check what base items I have available to me (as a whole) for any crafting I hope to try, without having to locate and check every individual PC within my group.